Poha is a very popular breakfast in India. It is a quick, easy, tasty and healthy dish to make. Put poha in a strainer and wash it with clean running water for 2 minutes. Keep aside to drain. Sprinkle turmeric powder, sugar and salt in the poha. Mix it gently. Heat up a pan and dry roast peanuts till they become crunchy. Keep aside for later use. Heat oil in a pan, add mustard seeds and let it splutter and crackle. Then add sesame seeds, green chillies and curry leaves. Sauté this for 30 seconds. Now add onion and sauté till they become soft and translucent. Add potatoes, carrots and little salt, cover the pan with a lid and cook till it is fork tender (May take 5 minutes). Stir it halfway. Add the poha and stir it gently to mix all the spices. Cover it again for a minute. And stir it again. Add roasted peanuts and coriander leaves and mix everything well. Sprinkle lemon as required. 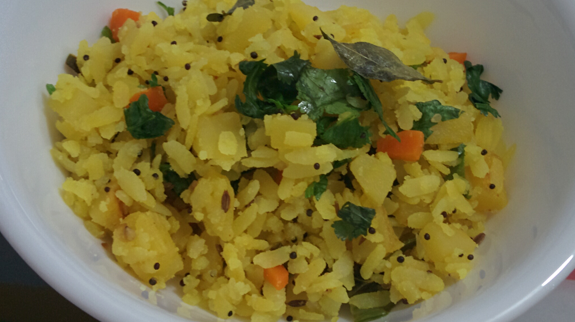 Serve this poha hot with a lemon wedge and sev. Garnish it with some more coriander leaves and peanuts. Enjoy! Adding sugar is optional, you can skip it completely. 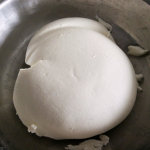 Add 2 tablespoon of warm milk while re-heating for a moist fresh poha. Do not wash too much or else it breaks and get mushy. Wash till poha become soft but remain whole and separate.